BIONOTE PCV‐2 Real –Time Detection Kit is useful for detecting the infection of porcine circovirus‐2. The kit can be exactly performed to detect DNA of porcine circovirus‐2, so it can be used for both qualitative and quantitative analysis. It works most of Real‐Time PCR apparatuses of block and capillary type. BIONOTE CSFV Real –Time Detection Kit is useful for detecting the infection of Classical swine fever viruses. The kit can be exactly performed to detect DNA of Classical swine fever viruses, so it can be used for both qualitative and quantitative analysis. It works most of Real‐Time PCR apparatuses of block and capillary type. BIONOTE PRRS Real –Time Detection Kit is useful for differential detection the infection of EU/US strain of Porcine Reproductive and Respiratory Syndrome Virus. 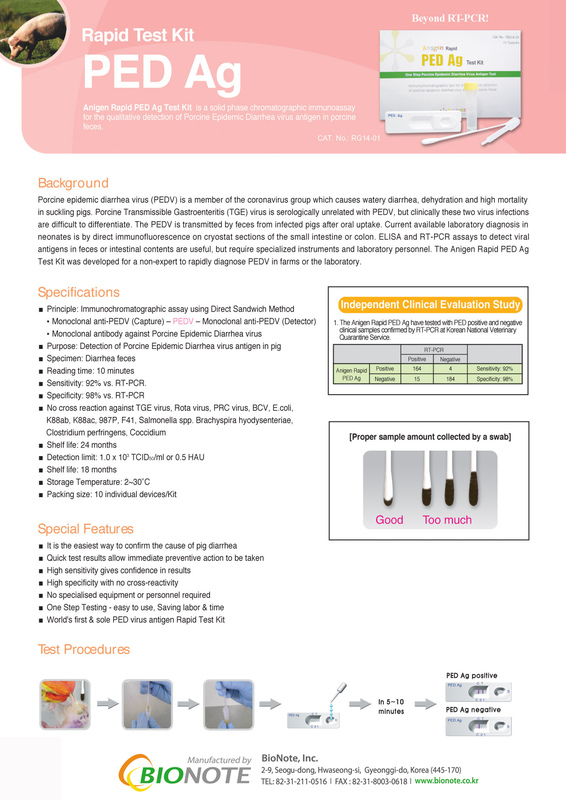 The Kit can be exactly performed to detect RNA of Porcine Reproductive and Respiratory Syndrome Virus (EU/US), so it can be used for both qualitative and quantitative analysis. It works in most of Real-Time PCR apparatuses of block and capillary tubes. 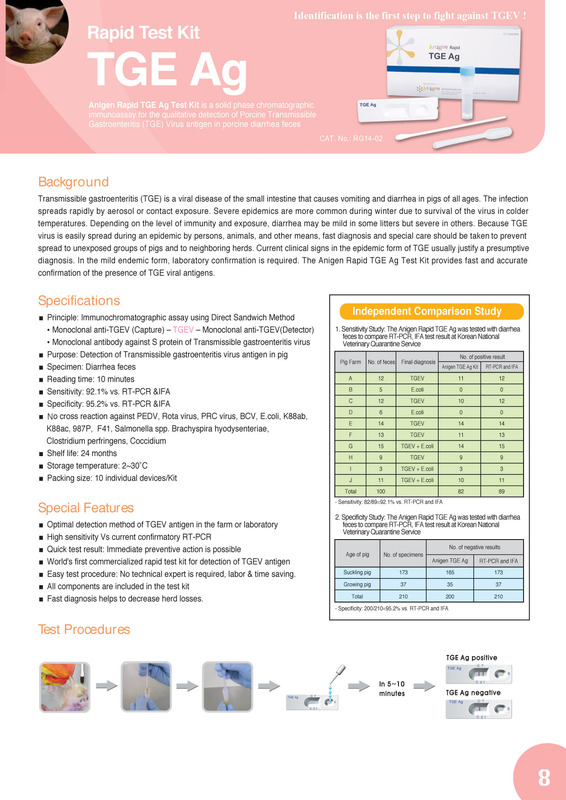 The Anigen Rapid FMD Ab Test Kit is an immunochromatographic assay for the qualitative detection of FMDV antibody in whole blood, plasma and serum from bovine, ovine and porcine animals. 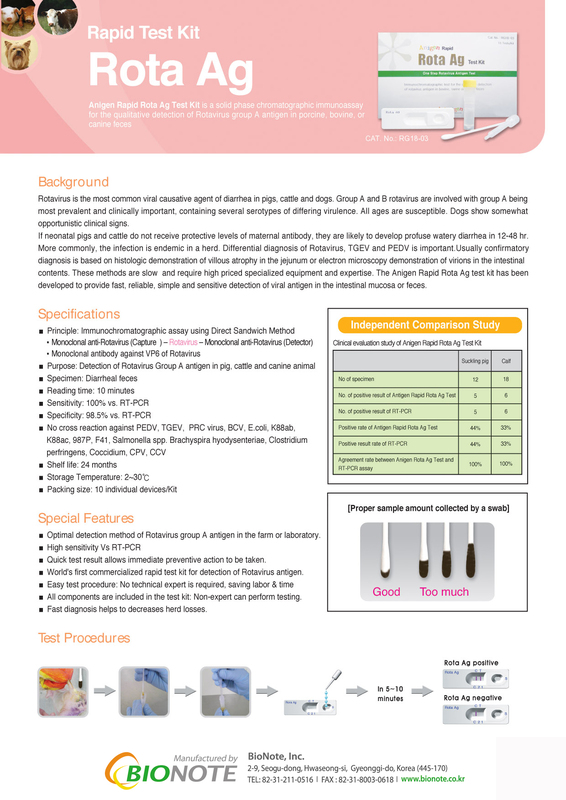 Anigen Rapid Swine Influenza Virus Antigen Test Kit is a chromatographic immunoassay for the qualitative detection of swine influenza type A virus antigen in swine nasal fluid or tracheal swab and lung tissue in autopsy. 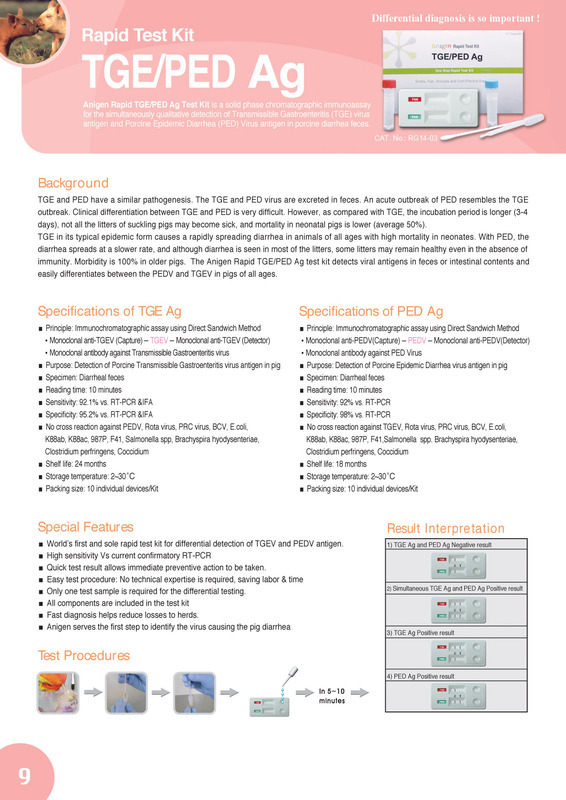 The AniGenn One Step RT-PCR Kit® provides a convenient format for highly sensitive and specific RT-PCR using any RNA. Influenza A (H1N1) Real-Time Detection Kit® from BIONOTE, Inc.is useful for detecting the infection of novel influenza (H1N1) virus. SIV Real-Time Detection Kit® from BIONOTE, Inc. is useful for differential diagnosis of Swine Influenza virus. The kit can be exactly performed to distinguish classical swine influenza between novel Swine Influenza, so it can be used for both qualitative and quantitative analysis. It works most of Real-Time PCR apparatuses of block and capillary type.